Home Basketball Laso: "Llull's resignation is assumed, if he was not pissed off"
Laso: "Llull's resignation is assumed, if he was not pissed off"
The Madrid coach asks the fans "more support than ever" and praises Calathes: "He is one of the best in Europe, if he is not the best". Madrid starts this Wednesday at the WiZink Center (21:15, Movistar + Deportes) the quarterfinal playoff of the Euroleague against Panathinaikos. Llull is low and there is expectation to see the duel between Campazzo and Calathes. 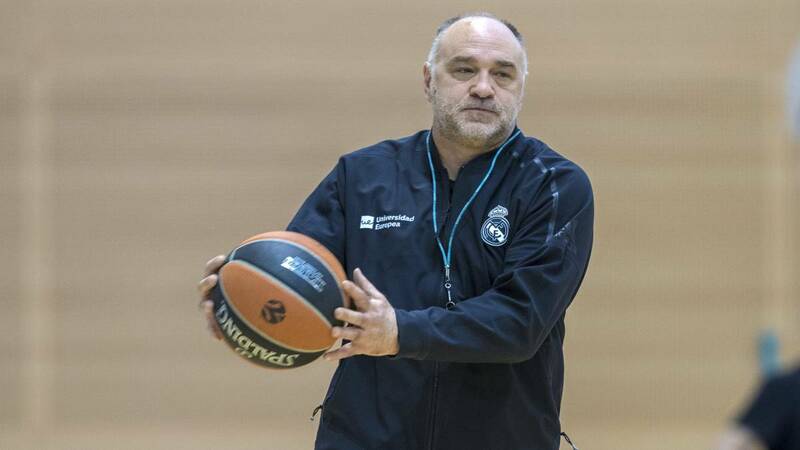 Pablo Laso attended the media in the previous and spoke of the Greek base: "Calathes is, if not the best, one of the best players in Europe, but nobody is above the teams" . The coach asks the public "support More than ever "and almost discards the presence of Llull:" It will be very difficult, if not impossible, to play this playoff. With the passage of the days his absence is assumed, because otherwise he would be pissed all day ". And when asked about the previous plans for this tie, he set an example to explain that sometimes there are surprises: "I never thought that the best defender of Spanoulis in the Final Four of Madrid (2015) would be KC Rivers and it was ". Start playoff. "There is one of the hardest and toughest moments of the season against one of the best teams in Europe, we are good, we have trained at a good level for the last two weeks, although we have an important player of the 16 that is not available (Sergio Llull) Panathinaikos has made a very solid regular league final, it is a good team physically and in the open, in which Calathes clearly marks the rhythm surrounded by good scorers, they will force us to be very focused ". El factor cancha. "It is always important to have the support of the public, which today I almost never ask for the support you always give us." We want to feel supported from the first minute, sure there will be a great atmosphere, we need everything to get this forward ". In the middle of Holy Week." I do not think much about matches being on Wednesday and Good Friday, who likes basketball and Real Madrid is not going to Obviously, there may be easier days to combine. " Last year's qualifier . "It changes everything a lot from one year to the next, coaches, players ... what does not change are the colors and many important players who repeat, but I do not think of similarities, although I would like the final result to be maintained" . Panathinaikos the worst possible opponent? "No, because we could have played Baskonia, Zalgiris, Efes, Olympiacos, Bayern ... I saw a lot of difficulty and I had no preferences, what worried me was that we arrived well And the bad luck is that Llull got injured two weeks ago and it's going to be very difficult, if not impossible, for him to play this playoff for a muscle injury ". Luull's drop. "With the passage of the days his absence is assumed, because otherwise he would be pissed all day. The first one who does not want to lose it is him. When they tell you that it is a muscle injury and the time that is going to be low is the first 'shock', but now we are focused on recovering as soon as possible and in a match against Panathinaikos in which he will not be able to play. " Stop at Calathes. "If he gets 50 points, gives 25 assists and takes 25 rebounds and we won, I sign; although if he makes those numbers I see it difficult. Calathes is, if not the best, one of the best players in Europe, but this in the end is a Madrid-Panathinaikos and you can not think of players over the teams ". What Campazzo does not take a constipated . "I pray at this time of the season because none of my players take a constipation. In his position there are fewer options, so the question answers on its own ". Rick Pitino. "He is a great name coach, but in Europe we think more about what he has done in the United States, where he has great prestige. His arrival at Panathinaikos surprised everyone, but the time he has been training at a high level speaks very well of his abilities. I have a lot of respect for him. Compared with Pesic? It has nothing to do with it. What he has done is change the style, I do not know if better or worse, with respect to how they played with Xavi Pascual. Maybe the results of the end of the season will tell you. " The plans for the duel Campazzo-Calathes. "I always have in my head what I'm going to do in all the matches and then, surely, I do not do even half of what I thought. Faults can change everything. The coach can have an idea about the rotations, but then you make a lot of decisions about the game. It would be absurd to say that tomorrow Facu will play 35 minutes, what if he does three personals at the start? We have always talked about rotations, what we want to do in attack and in defense, but the match then conditions everything. " " In addition, Panathinaikos will have another plan and it will be different from ours. Sometimes, even, things happen that surprise for bad andothers for good and I give an example: I never thought that the best defender of Spanoulis in the Final Four of Madrid (2015) would be KC Rivers and it was. These things happen. I thought that this pairing would take little time, but we knew how to take advantage of it. Those things happen and I do not know how long Campazzo and Calathes are going to play, but they will be important ".